Video game rental service GameFly took to the cloud a couple of months ago via a partnership with Amazon that allowed gamers to rent and play titles over the Internet. The one catch, of course, is that you needed an Amazon Fire TV set-top-box to do so. GameFly is now expanding its streaming service – which it dubs the Netflix of games – courtesy of a new collaboration with Samsung. Starting today, those with select Samsung Smart TVs can also get in on the GameFly Streaming action. All you need is a Samsung Smart TV made in 2014 or later and an Internet connection (I suppose you’ll also probably want a controller of some sorts). GameFly says the minimum bandwidth required is 5.0Mbps, 8.5Mbps for HD and a wired 10.0Mbps connection if you want the optimal experience. The service is currently offered in nearly two dozen countries; a full list of eligible countries can be found their site. Unlike Netflix’s all-you-can-eat business model, GameFly Streaming offers bundles that include access to a set number of games each month. Pricing starts at $6.99 per month for a bundle of seven games and scales up from there. As of writing, there are around 40 titles to choose from. 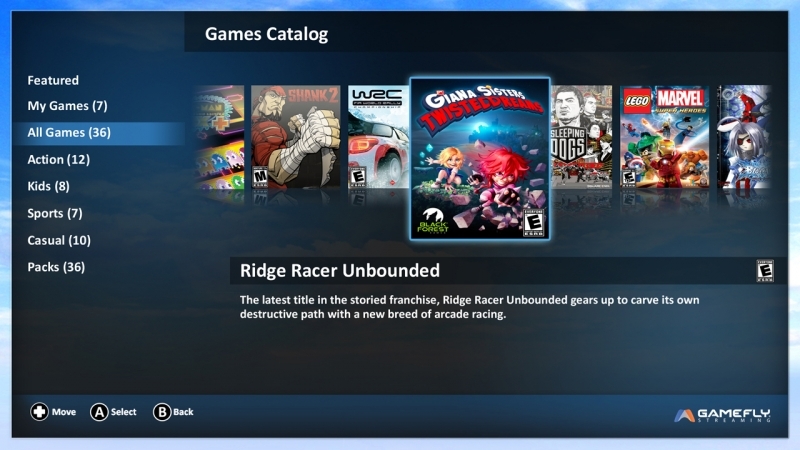 Cloud gaming has been around for several years now yet surprisingly enough, the concept hasn’t really caught on as many thought it might. Industry pioneer OnLive called it quits earlier this year while budding service Gaikai faired a bit better, having been scooped up by Sony in 2012 for $380 million and rolled into its PlayStation Now service.